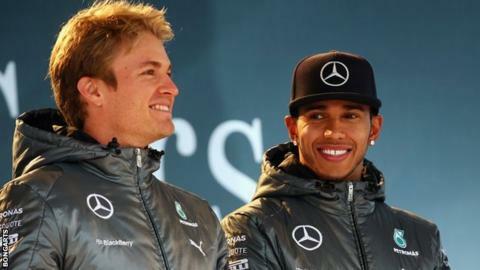 Lewis Hamilton says his relationship with Mercedes team-mate Nico Rosberg is "back to normal" following the conclusion of their title fight. Hamilton won his second drivers' title in Abu Dhabi last Sunday after a season-long duel with Rosberg, 29. The Englishman, also 29, said: "We had a filming day the other day and all that tension disappears. "It goes back to being two normal individuals talking about the normal things guys talk about." The season featured two key turning points around controversial incidents at the races in Monaco and Belgium. In Monaco, Rosberg went off on his final qualifying lap, preventing Hamilton from having the chance to beat him to pole position. Hamilton felt the German did so deliberately. In Belgium, the two drivers collided, effectively putting Hamilton out of the race. He emerged from a post-race meeting with Rosberg and Mercedes bosses, which turned into a full-blown row between the drivers, to say Rosberg "basically said he did it on purpose". Rosberg, in turn, was unhappy about some of Hamilton's tactics while defending the lead at the Bahrain Grand Prix. The two drivers, who have been friends since they raced together in karts 14 years ago, met for the first time since the Abu Dhabi race at Mercedes' end-of-season Stars and Cars event in Stuttgart. Referencing the embrace the two shared in the pre-podium room in Abu Dhabi, Hamilton said: "You saw Nico come over after the race and that underlined the respect we have for each other, and even though we had difficult times through the year we came out strong." Asked if they had any regrets, both drivers said they did not. Rosberg said: "There are things I would do differently; that's natural. But regrets? No, because it's often in difficult experiences you grow the most and learn the most. "All in all it's been a great year. The end result didn't go the way I wanted but now, taking a step back, it has been such an awesome experience." Hamilton said: "I wouldn't change it for the world. Even though there were low moments, I came out stronger in the end so I'm glad things worked out the way they did." Asked if he felt he would come back stronger in 2015, Rosberg said: "It's an awesome challenge. Lewis's level is extremely high. This year he was the best driver and I look forward to that battle next year." Hamilton is due to meet with Mercedes bosses to discuss extending his contract beyond the end of the 2015 season but said he had been too busy this week with promotional appearances to do so. He added: "I can't see myself anywhere else. I never had dreams of driving for Ferrari. Of course, the car looks nice in red. But I can buy red Mercedes cars, it's no problem."